In 1980, Paul Ehrlich, a world famous biologist and author, accepted a bet proposed by Julian Simon, an economist. The bet was to resolve an ongoing debate about resource scarcity. Ehrlich chose five metals (copper, chromium, nickel, tin, and tungsten) and hypothetically bought $200 worth of each. 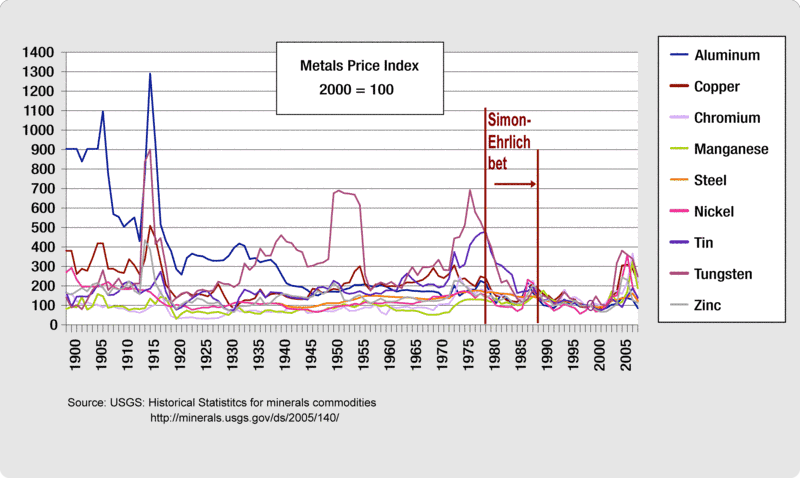 If the real price of the metals increased over the following decade, Ehrlich wagered, it was an indication of increased scarcity. Simon won the bet. The real price of all five metals declined, signifying less scarcity. Timing is everything. As demonstrated in the figure, the prices of metals wax and wane over time following an overall downward trend. Regardless, Simon’s point remains true. It is human ingenuity that prevents us from running out of resources – even finite resources. The key is not that prices continue to fall over time, rather that prices reflect consumer desires, and producers, given appropriate institutions, will respond. Prices do reveal scarcity by increasing which, in turn, encourages conservation, substitution, and increased innovation and supply. In the end, the problem of scarcity is resolved by market coordination as shown by prices that peak and fall through the course of history. If the car were to all of a sdduen vanish, the commercial implications would be totally most unlikely to forecast.